A few weeks before our trip to La Pollada De Laura, we visited a Thai restaurant in Woodside called Arunee. At the time in 2003, the legend of Sripraphai, the most famous Thai restaurant in Queens, was already cemented. Arunee, on the other hand, in Jackson Heights, was still comparatively undiscovered until Eugene steered us in its direction. The meal, I recall was spectacular, but, unfortunately it was one of the few, due to a family emergency at home, I never reported on. Queens was our destination again, and what follows is our experience at a Peruvian restaurant called La Pollada de Laura. Zio’s misadventures driving around Jackson Heights searching feebly for Arunee, the Thai restaurant we last visited, convinced him to take the subway from his love nest in Astoria to our next destination, La Pollada de Laura in Corona. I also planned on the subway, the 7 train, and before leaving we tried to coordinate it that we would meet at the 103rd St Corona station. To help we came equipped with cell phones. The Peruvian restaurant Rick chose was located on Northern Boulevard. Having been in Corona only once, when my car broke down on the Long Island Expressway many years ago, I was clueless as to how to get to Northern Boulevard. The Colombians, Mexicans, Dominicans, and others Latin American immigrants were out in large numbers around Roosevelt Avenue on this pleasant Spring night, but getting an answer to my question; which direction was Northern Boulevard, spoken in English, did not produce immediate results. I tried calling Zio’s cell phone but another 7 train had rumbled into the station above muffling any chance I had of communicating with him. Finally, using sign language, I was pointed in the direction of Northern Boulevard. Once clear of the elevated tracks, I was able to make phone contact with Zio who had already found the restaurant. As I made my way the very long five blocks to Northern Boulevard, Zio and I had a running commentary on the bustling neighborhood where even the music from the ice cream trucks had a Latin tinge to it. Gerry and Eugene were seated and the music was blasting as I entered La Pollada de Laura. Rick soon joined us and after Eugene regaled us with stories of his Times Square Madame Tussaud’s experience, as if we were interested, we were just about ready to order. The menu featured numerous ceviches, a Peruvian staple. Eugene, without elaborating, was determined to sample leche de tigre, otherwise known as “Peruvian Viagra.” The very friendly waitress happily explained the lore of the dish; that among its health benefits was an enhancement of male virility. Not that anyone of us, with the possible exception of Eugene, believed her, but it was the sweetly innocent way she explained it that made us order not one, but two leche de tigres. Rick had mentioned that the owner of the restaurant, Manny, would help us decide what to order from the menu. But Manny had not arrived, so it was up to the ever-helpful waitress to recommend how we should proceed. Instead of a few different ceviches, she suggested we go with the ceviche mixto, which had a little of everything; fish, octopus, squid, shrimp and conch. I’ve had the famous Peruvian pollo a la brasa (roast chicken) at other Spanish restaurants, but wanted to try it here. We also ordered a jalea grande, a mix of fried fish, shellfish, potatoes accompanied with a salsa criolla, and with a nod from our waitress, lomo saltado de carne; beef with slices of onions, tomatoes and French fries. While we waited, we were brought a pre-meal snack; tiny pieces of purple, salted corn kernels. 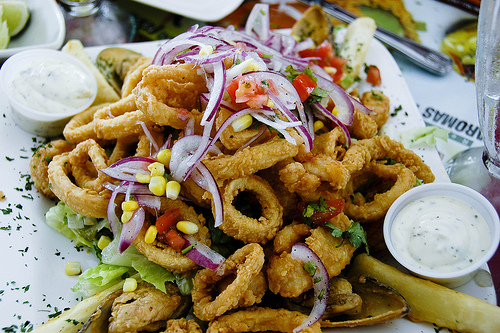 They went well with our Peruvian beer, Cusquena. The leche de tigre was first to arrive at our table. 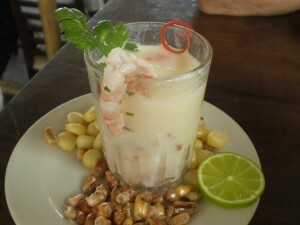 Large shrimp and half a blue crab hanging over a tall glass filled with a milky liquid; the “tigers’ milk.” I immediately tasted a spoonful of the liquid—the “leche”—was the juice used to marinate, or “cook” the fish with lemon, lime, cilantro and peppers. And there was only so much of that juice you could actually drink without “cooking” the inside of your own mouth. Virility, male or female, was most definitely needed to down a big glass of leche de tigre. At most of our food adventures, once the food begins to arrive, there is little room on our table. But we eat quickly not only because we can’t help ourselves, but because the quicker we eat and dispose of a platter, the more room will be found at our table for another entrée. This night was no exception. The delicious lomo saltado was devoured before the ceviche mixto even arrived, but still, our table was crammed with a whole pollo a la brasa and a monumental-sized mound of jalea, fried mixed seafood cooked to perfection. When the ceviche arrived, we found room on the table for the equally large portion; the squid, octopus, fish and other seafood tenderly marinated, smothered in red onions and swimming in the lemon juice. Manny eventually showed up and brought us his homemade hot sauce. Ignoring Manny’s warning of its intensity, Rick smothered his ceviche with the sauce and soon the sweat was flowing alarmingly from his forehead. Finishing what was on the table seemed impossible, but given time we did not disappoint. 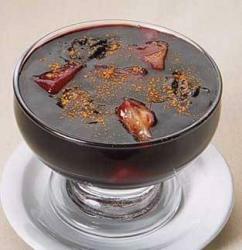 We even had room for dessert, trying Manny’s recommendation, mazamorra morada, a crimson-colored gelatinous mess that prompted Zio to make a comment about blood, brains, and shotguns. Though collectively not to our liking, Eugene could not resist mentioning that it was better than the infamous beans of halo halo from Ihawan, the Filipino restaurant we visited a year ago. Amazingly, all of what we ate came under our budget and then some. As Zio and I tried to walk off the meal in the four blocks to the subway, we wondered how, with prices like that, La Pollada de Laura could actually stay in business. Before either of us could respond, the sound of the number 7 train drowned out any hope of further conversation. In the book I write about New York City, I recommended pairing a meal at La Pollada de Laura with a visit to the nearby Louis Armstrong House Museum, where the jazz great lived from the 1940’s until his death in 1971. Unfortunately, several years ago, La Pollada de Laura closed thus answering our 2003 question wondering how they could stay in business considering the prices they were charging.